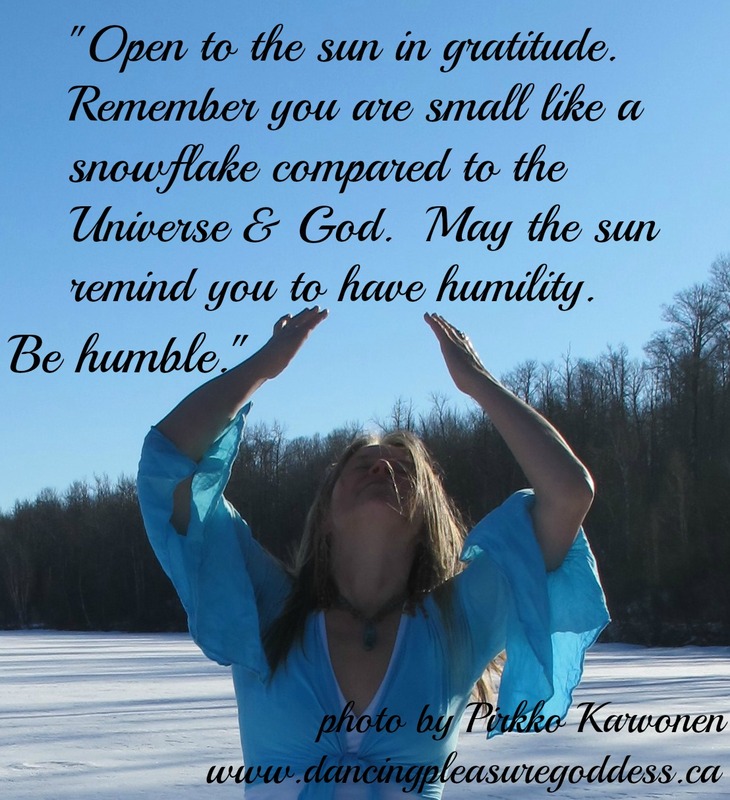 Each day on my journey I take a moment to be grateful, to practice & remember humility. When I feel the sun on my face and take in its enormity, I am reminded that I am but a small speck in the universe, in God’s creations. I am insignificant. The Divine is great. Allow this to be both freeing and humbling. Remember you are nothing AND you are everything for within you is all of creation, Source. May this grant you the humility to remember that all of your greatness is not yours, it is all God. The freedom in this is also that you cannot fail. Every step no matter how small or big, whether it looks like success or failure is a step forward. Gratitude to my Mom, Pirkko, for taking this photo of me. At this moment when she took this photo it was a very cold below zero Alberta winter day with high wind chill factor. My mom was in the middle of her second round of chemotherapy to heal from cancer. I asked for her help to take photos of me. My Beloved Rich Sukh drummed, I danced & my mom took photos. Grateful for moments of connection. May you live each moment of each day. I love you. Be humble. Be grateful. In deep gratitude to God for these words.